I learned a great deal about Lincoln character, his ability to manage his cabinet with the travails of many dissonent personalities, and his ability to inspire the US to take up the fight to prevent succession and spread slavery. After you understand the history, the persona of the American character at the time, and the struggles they endured then Lincolns speeches become vibrant and immortal. This book is a must for anyone interested in the lead up to the Civil war, the war itself, and interested in understanding Lincolns timeless character. The narrator was slow at first. I increased the speed on my audiobook player to 1.75X and it made it much easier to listen to and quicker to get through. Many times I waited in my car for a chapter to end before I was ready to let the book go! Long but well worth the insights and knowledge gained. This book has really peaked my interest in gleaning more about Pres. Lincoln and this period of our history. His leadership and team orchestration skills are what this country needs now! The book starts a bit slow, but by the time you reach the Chicago convention you're immersed in the lives of these men, and by the end you can often guess how each man (Chase, in particular) will react. Fantastic listen; well worth the 40 hour investment. 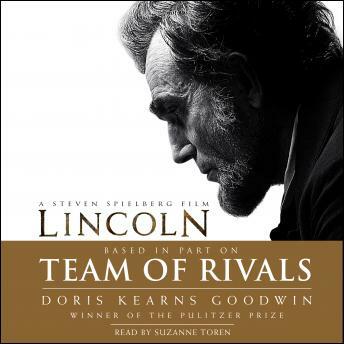 There are books and then there is Lincoln 'team of rivals'.. 40 hours but each minute was worth listening.. amazing. leaves me wanting to learn of lincoln!